« 6 Reasons To Be In Good Health Before You Do Short-Term Mission Trips! Although anyone can get sick anywhere in the world—including at home, with a few precautions, you can minimize your chances either of getting sick or of irritating some pre-existing condition you might bring with you on your mission trip. Here are some things that Sherrylee and I have learned to do—and we have rarely been sick in all of our travels to all parts of the world. I’m not a medical doctor, so the information I’m giving to you is totally based on experience. If your doctor tells you something different, then he is right!! If you deal with chronic health issues, choose your destination more carefully If you have severe asthma, you might want to go to a place that does not have severe air pollution. If you have knee issues, you might not want to go to a church that meets on the fourth floor with no elevator. If you have immunity issues, you might want to go to a more hygienic country. You do have choices! God’s people all over the world need help, not just in the countries that would most endanger your health. Go with people who understand your health needs. This is usually a spouse or near relative, but if you are not going with someone that close to you, then go with a good friend to whom you can fully disclose your health situation. If you are not willing to tell someone the full story, then you probably should not go. Get all of the appropriate vaccinations and shots before you go. 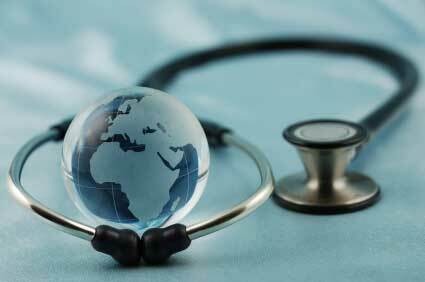 The CDC is an excellent source of information about health and foreign travel. You may have a travel clinic in your city, and they too will provide good information and the medications that you need. Take all the medications/equipment needed with you for any chronic condition that you have, including prophylactics to prevent the onset or to control an unexpected attack or event. You cannot count on getting medicines you might need, nor seeing a doctor for a local prescription, so get enough for your whole trip–and a little longer–to take with you. Be sure and put your important medicines—whatever you can’t do without–in your carry-on, just in case your checked luggage does not make it to you! I always include my extra contact lenses and/or an emergency pair of glasses. And if you are prone to bronchial distress or events related to diabetes or hyper allergic to . . . anything that could become life threatening, just be sure you take with you whatever you would keep handy at home. Don’t go if you are already sick! This seems so logical, but after you have bought expensive tickets and made very important plans, it is hard not to get on the plane. It might be easier to make the right decision if you have Travel Interruption/Cancellation insurance that covers illness. It is also possible to change most tickets for a fee—which is worth it to you, to your fellow passengers, and to the hosting people you might be infecting if you go. Try to adjust to local time zones as quickly as possible so that you stay rested. Starting your trip more rested and sleeping on the international flight go a long way towards helping you feel good when you arrive and adjusting more quickly. Short-term missions do not lend themselves to lots of rest, so if your health requires more rest, you may have to sneak away for a nap every now and then. Be aware of everything that goes in your mouth! We all wish we had iron stomachs that could eat anything anywhere, but most of us don’t. On a short-term trip, you really don’t have enough time to adjust to local bacteria like a long-term worker can, so you just have to be careful. Water is a big culprit. Safest is not to drink anything that is not bottled—with the lid commercially closed. Safest is to use the same bottled water to brush your teeth. Foods that have a high water content can be bad also, so avoid lettuce, soups, ice cubes, and jello that are made with unknown water. Honestly, this is very hard to practice 100% consistently, so take the approach of just minimizing your exposure to bad water as much as you can. Wash your hands a lot—with soap. While I’m generally opposed to overuse of anti-bacterial hand products, I use them regularly when traveling overseas for added protection. Follow the suggestions of the local hosts. If they say use a mosquito net, then do so. If they say don’t eat from street vendors, then don’t. If they say, take malaria meds, then do it. The only thing you have to be careful about here is when you are with locals who have not traveled out of their country and do not understand what your special needs might be. Know the difference in yourself between minor sickness and major sickness. Almost everyone who travels internationally has experienced some degree of upset stomach and/or Montezuma’s revenge. Most people don’t die even from food poisoning that can occur no matter how careful you are. One can become dehydrated though, so treat your symptoms and monitor your condition even with minor things so that they don’t become major. In almost all countries, you can trust local doctors for treatment of minor sickness, so don’t be afraid to ask for help if a minor illness seems to last too long or you begin feeling even worse. Again, let me say that if you are in pretty good health, then you can participate in most short-term mission programs. But even the healthiest of us will be more effective on our mission trip if we stay healthy! We don’t have complete control over that, but these few tips will certainly help you. Now, Go . . . into all the world!